The history of Algerian agriculture is little known in Anglo-Saxon circles, deserves a reconsideration of the history of its development. But talking about agricultural and rural development in Algeria today cannot be done without referring to the history that has built or destroyed the current agricultural and rural economy. Using a historical approach, our article attempts to correlate historical events with their influence on farmers and economic outcomes. The history of economic and social development has not really given priority to the agricultural sector. Its dynamics remained closely linked to the rank that the State gave to it, in terms of technical and financial means. The period before the colonization had influence on the social structure and on the mode of production but little on the agrarian structures. French colonial history has had social, economic, cultural and even political consequences for the country as a whole. This populous colonization, having uprooted and expropriated the farmers in the service of the metropolis did not develop the Algerian economy. But independence has not called into question colonial practices, as the imposition of socialism by military force and political and economic pressure has failed to meet the challenge of food self-sufficiency. Proponents of socialism wanted to create a new and modern Algeria according to their own conception (one leader, one plan for tone country of 2.4 million hectares). The advent of Liberal influence in 1979 was not facilitated by the circumstances associated with the reduction in the price of oil, but some of its results were encouraging. The peace found in 2000, after ten years of civil war, a hope had appeared but the policies initiated failed. Here is the essence of this contribution to understand the past and better reason the present to take the best initiatives for the future. The study of the Algerian experience of agricultural and rural development since the political independence is interesting for several reasons: The voluntarist option of economic and social development committed since the independence allowed to make transformations of the agrarian structures inherited from the colonial period then launched development actions, which made it possible to present it at the time as an example to be followed for third world countries. Several observers considered that the Algerian model is an original reference allowing the emergence of a self-centered industrial economy independent of the dominant models during the Cold War. This experience is characterized by the profound transformations of agricultural structures at the beginning of each new agricultural policy: Thus, there are four main phases reflecting the type of agricultural and rural policy decided by the powers in place. Transformations in the agricultural and rural sector have always taken place without the real participation of the main actors of the agricultural and rural world. The development process remains marked by its authoritarian and dirigisme character. Beneficiaries are informed only at the end of the design process and at the start of implementation to show their support in order to benefit from the aid and subsidies decided in the budgets allocated through the mechanisms and procedures decided in the context of these policies. Through this article, we will present the main phases through which this experience was spent in order to make a judgment of the impact of the various development actions on the agricultural and rural sector. The mobilization of public resources, whatever their importance, should have repercussions on the target populations and on the national economy. This assertion becomes possible only if evaluation as an institutional and technical procedure is important in the process of carrying out development programs. It is also legitimate to consider that the absence of this procedure since independence to date is one of the factors of bankruptcy as long as the mistakes made during the achievements are never identified and corrected and as long as the good practices are not formalized to be resumed and valued later. Talking about agricultural and rural development in Algeria today cannot be done without referring to the history that has built or destroyed the current agricultural and rural economy. But it is clear that we cannot separate agricultural and rural development from global development. The history of economic and social development has not in fact given a strategic place to this sector; its dynamics remained in fact closely linked to the industrial sector, considered as locomotive of the national economy. In spite of the reseved results of the diverse actions of development committed by the successive governments which in principle owes, " by the mechanisms of the distribution and the comfort will allow the individuals not to depend completely on the market for their survival but guarantees for them other forms of existence " , the actual agricultural policy, opens the way towards a new vision of the development which deserves an analysis of his socioeconomic impacts on the country. In first it is necessary to ask itself the following question: what impacts of the different phases of Algerian agricultural history on economic developments and which from them who are really stood out agricultural policies? The economy of Algerian society before French colonization is analyzed as a "pre-capitalist social formation" by certain theses [2-4]. Most historians consider that the economy of Algeria during this time was mainly based on two main activities: cereal agriculture and livestock. Transhumance and semi-nomadism as a mode of management of space prevailed in the plains to the borders of the Sahara. Technical requirement and adaptation to the environmental conditions (climate, water, etc.) of a cropping system and a rearing system where the practice of fallowing ho has a dual function: on the one hand resting the soil following two successive crops (three-year rotation) secondly, it’s constituted a reserve of manure and especially of herbs for the herd during the lean season between winter and spring. In the mountain areas, subsistence agriculture and the diversity of activity that will feed the life of urban centers especially in the lowlands, since "The sedentary lifestyle is not exclusively urban, it is largely rural, as the country is essentially rural, although urban populations have always existed" . Estoublon and Lefèbure describing the economic activity of the nomad in Algeria at the beginning of the 20th century consider that "Two thirds of the indigenous populations live indeed from the life of pastor . The flock, especially the goat, provides milk which is the main food of the Arab and his family; the wool of the sheep furnishes the garment, the burnous, mixed with the goat's hair, it is used to make the tent which is the house or the shelter. We understand then the importance of sheep and goats in the life of the native. According to some authors, the rural population of Algeria at the beginning of the nineteenth century represents between 90 and 95% of the total population. The tribal organization of society is the main mode of social, economic and political functioning of the community (the Makhzen tribes, an important link in the hierarchy of the Turkish state, and the Raia tribes which is subject only by taxation). The management of the territory and the organization of the economic activities are done according to a certain tribal logic since each time a tribe finds that its territory is small enough to feed all the members of the tribe, this one will try to absorb the tribes surrounding areas, which constitutes (conflicts) a source of demographic regulation. The land of the tribe was not a collective property since there were no collective works on these lands but they were a common space "Arch land" or "bled Djemaa" on which were exercised activities as private form (grazing, cultivation, mountain farming, etc.). So the tribe is the setting where individual practice is the rule. Moreover, many attest to the existence of private ownership of the means of production during the pre-colonial period, particularly in the mountains and the Haouz (neighborhoods of the cities). Berque J, sums up the situation of the pre-colonial period, which seems to resemble the current development effort “The relative mediocrity of the techniques contrasts with the superiority of the social apparatus. The social is experiencing a real hypertrophy here. The profusion on all sides overflows the suggestions of the physical environment. In proportion, it ends up being a cause of stagnation as decisive as in other circles the ritual overabundance. The analysis has revealed in detail this disproportion between material techniques on the one hand and social organization on the other”. After the drying up of the commercial circuits for the benefit of the new European powers, the Maghrebi dynasties, which had based their civilization on trade, on the tax on the subject tribes and little on the agricultural surplus, turned towards the increase of the tax to safeguard their military power. Thus the power of the tribal organization is strengthened to oppose the central power, and that leads to the weakening of the state-dynasties and the decline of the cities. This market social base means that the source of reproduction is totally external (circuit of gold, slaves and salt) thus marginalizing the self-supply of food and the nourishing sector which is agriculture. For this the power of the dynasties did not survive the slightest changes in the orientation of the commercial circuits since it was isolated from its social base, which allowed him to self-recharge and defend the territory. In other words, all regimes based on the central military power lose not only their economic base but also and above all their social base. The class struggle in this pre-colonial Algerian formation appears more in the countryside and moves the different existing social forces: Khammes, shepherds, Azel workers and beylikales lands, rural feudal and city dwellers, local merchants (Kaïd, Bacha-Agha, etc. ), small peasants, koroghlis, zaouias and other religious authorities, etc. French colonization by directly attacking the land structure has attacked the mode of organization that ensures social cohesion and the balance between man and the environment. The lifting of non-alienation and the indivision of the land and the transfer of this sequestrated, in the domain of the colonial state will upset all social structures, the mode of agro pastoral organization (nomadism and self-subsistence) and the cereals / livestock production system. The transformation of the tribes into Douars (the process continues with the transformation from village to town, town to wilaya) with the Sénatus-Consulte of 1863, led to an artificial grouping of people led to the dismantling of the social framework including the collapse has had repercussions not only economically but also humanly and psychologically . The agricultural colonization of the lands was carried out first on the plains zones (littoral and interior plains) seen the richness of the grounds and the best climatic conditions of which they benefit for a speculative agriculture totally directed towards the exportation. On the other hand, the repression and cantonment of local populations in the mountain ranges and the lean lands has resulted in the disorganization of the rural world and pre-existing production systems. The results of colonization led to the establishment of large colonial farms in all parts of the country, the dislocation of family production units under the influence of demographic pressure and colonial laws. These transformations are at the origin of the constitution of an agrarian bourgeoisie, a non-capitalist commodity peasantry and a proletariat of agricultural origin for all sectors of economic activity . The colonial economy was based essentially on the exploitation of the best lands near the Mediterranean coasts, expropriated at the price of confirmed pains and genocides in several regions of the country. New settlers from France and other European regions (Malta, Spain, Italy, etc.) operating more than 2 million ha of fertile land have set up production systems mainly for the European market and mainly the metropolis. The impoverishment of the populations was accentuated where the famines were accompanied by epidemics in 1867 to 1868 where one million Algerians perished . The imbalance created by the colonial system in the mode of appropriation and exploitation of space through multiple binding laws, for the masses of peasants already confined in fragile areas such as: the code of forests, the water code the land laws of 1834 and those of 1846 to which it will be necessary to add the laws of the Sénatus- Consult of 1863 supplemented by the Warnier Act 1873, the Code of Indigenat 1881, and the war economy laws of 1918 and 1939. The totally extroverted colonial economy, where the surplus was invested in France and in Europe, did not provide any employment opportunity in Algeria. All the French in Algeria have an average annual income of 350,000 francs per person, while that of Algerians is less than 50,000 francs and represents less than 20,000 francs for the mass living in the traditional sector. The social consequences also appear in the non-integration into the economic circuit of 2.5 million Algerians. Total and partial unemployment in the cities concerns 990,000, the rural exodus, the emigration of 400,000 Algerians to France, illiteracy (more than 4/5 of people over 6 years old are illiterate), the housing and health organization reflected by the multiplicity of slums and slums and the low level of health services in the countryside are all misfortunes experienced by an idle indigenous population. The agrarian dualism, created by a century and 32 years of sequestration, expropriation and marginalization of rural Algerian communities, is considered as a sign of a peasant resistance to a complete penetration of capitalism materialized by the relative immobilization of at least half of the agricultural land (58%) in the traditional sector. The so-called modern colonial sector has not introduced new production techniques and has not expanded the training and know-how of local agricultural populations. The introduction of monoculture (viticulture) and the low diversification of production has reduced the opportunity to invest in other modern technological niches . This phase is characterized by the winning-back of national sovereignty over the entire territory. The priority actions of the government have been more access on the nationalization of the resources and the means of production but also the negotiation with various partners for the implementation of structures and public authorities following the massive departure of more than 900.000 of Europeans of which 300.000 assets that provided the administrative and economic management of the country. The management of the consequences of the "burned earth" policy imposed by the French terrorist organization (regrouping the partisans of French Algeria), and a totally extroverted economy conceived in relation to France and for France, represented a concern of the Algerian Government after independence. The economic and social situation at Algeria's independence is considered serious and worrying since the country, at that time, had more than 2 million unemployed and 2.6 million without resources to meet their basic needs out of a total population of 9 million. According to some authors "Various disorders erupt, born of misery: peasant revolts especially in the Constantine district; extension of banditry; sporadic but continuous manifestation of unemployed people in the cities ". A very dense population movement (return of prisoners, refugees inside and outside the country) and whose requirements in terms of food, housing, security and health are not less important. More than 40% of the population lived in total misery; in 1964, there were 425,000 poor peasants (less than 10 ha in size) and 400,000 peasants without land. The first Algerian government needed to "get out of the hurry". The only resources available to respond to the pressing and urgent problems of the moment and subsequently to embark on a process of development crystallize in two sectors: Agriculture and the agricultural processing industries, which accounted for more than 85% of total exports. 1958; and the hydrocarbons, the export of which has begun to increase appreciably since 1959. The exclusive control of the State of these two sectors was intended, on the one hand, to control the allocation of resources but also to adopt development policies financed by these two sectors. In industry, the state supports from the outset all existing companies. It was through the purchase of the French State's shareholdings in the industrial operations of the Constantine Plan and the public services and establishments which were under the monopoly of the colonial State. The Company of Transport and Marketing of Hydrocarbons (SONATRACH) was created in 1963, then the National Steel Company (SNS), in 1964. These two companies were to constitute the launching bar of the industrialization strategy of the country (iron and steel complex ANNABA and the ARZEW hydrocarbon and gas complex). In the rural sector, this period is much more marked by the establishment of self-managed agricultural estates on colonial lands. The spontaneous departure of colonists and managers of colonial farms, created a vacuum, quickly filled as spontaneously by the employees of these colonial farms and landless peasants previously used as seasonal, which saved the agricultural campaign 1962/63. The harvests were all ensured and a takeover of the fate of the colonial farms by the workers became an unavoidable reality at the beginning. Marc Ollivier wrote on this subject “As is often the case, it is the concrete aspects, the material constraints of the situation that played the decisive role in deciding the issue. It was necessary to plow the land, irrigate the orchards, run the factories, and there was an event that nobody had foreseen: everywhere, in the colonization farms as in the abandoned factories, either spontaneously or under impulses. different from one region to another (trade unions, military, officers just out of the maquis, small officials of local administrations...), the workers in each field, each company, organized themselves into "management committee" and it succeeds, that This is a real self-management movement, and it is very effective in dealing with the imperatives of the moment (...)”. In 1962, agrarian policy did not receive sufficient attention with regard to ¾ of the population deriving their income and survival from this sector. Self-management, as a form of exploitation of colonial farms imposed by agricultural workers, especially those most politicized, will be generalized to fill the gap in which the sector was and "to safeguard the national productive heritage" according to Taibi Labri who was Minister of Agriculture in 1970. Thus there was a first official recognition of the creation of management committees created by the workers on the vacant agricultural fields (about 1,300,000 ha over 3000 colonial exploitations). 3. The Decree of March 28, 1963 deals with the determination of income distribution rules for self-managed domains. So, faced with the reaction to the occupation of the farms by the 150,000 workers who took over the agricultural activity, the State set up administrative institutions (DDA: Daïra Delegation of agriculture; DAW: wilaya delegation of agriculture), supply (SAP: Agricultural Provident Society, CUMA: Cooperatives for the collective use of agricultural equipment) and financing (CACAM: Agricultural Credit and Mutual Aid Fund) to mitigate the process of collective and autonomous ownership of vacant property by agricultural workers. For fear of being overtaken by the peasant movement which took the initiative of appropriation and control of the agricultural sector "... gave the decisive impulse: the new power soon realized that it could only follow these initiatives, under pain to increase the disorder and to create the most inopportune conflicts, even if it is necessary to recover them later and to take their control ". The centralization and multiplication of intermediaries between the farmer and the means of production (credit, equipment, inputs and extension) were privileged forms for the holders of power to control the sector. The bureaucratic tutelage of this spontaneous reaction of the workers, who were able to save the 1962/63 campaign, created a continuous demobilization of workers to take over the fate of agriculture on a peasant basis. S. Bedrani  writes in this connection "after the first revolutionary years of enthusiasm during which production was maintained, the disinterest of farm workers took place at the same time as a strongly centralized and bureaucratic management was reinforced". Thus ONRA (National Office of the Agrarian Revolution) will be in charge of all the operations that go from production, to the types of crops, from supply to marketing, from credit to investments, etc. The control of producer prices and marketing (the producer and consumer prices are set by the Wali (head of prefecture) from 1962 and may be different from one district to another) allowed state marketing agencies (OFLA, CCLS, ONACO, ONPO, ONLAIT, ONV, ORAVIO, etc.) to behave as a true agent, to whom it is obligatory to sell all production at the price previously fixed (to compensate for and catch up with overvalued prices in the industrial sector ) unfavorable to producers of state farms and cooperatives who cannot cover all their production costs and block any future investment capacity in agriculture. This policy of strengthening administrative control structures upstream and downstream of the agricultural sector leads to the loss of control of producers over the marketing sphere of agricultural production. Moreover, the nationalization of the agricultural sector (land, means of production, marketing, etc.) is the first premise of the syllogism of the peasants' betrayal at the origin of the 1954 revolution. This betrayal has been clarified through the cleavage of land and technology in the countryside to the detriment of the great mass of poor and landless peasants. For the vast majority of them, all that remained was to look for extra-agricultural activities as a condition of survival in the absence of land and means of production that enabled them to exercise what they knew best to do in order to improve the deplorable living conditions for which they fought for more than seven years. In this regard, AGERON writes "the threshold of undernourishment being estimated according to the regions and the years from 12 to 20 ha... economically two-thirds of fellahs (peasants) formed not an independent peasantry but a group of semi-proletarians" . The transformation of very large numbers of rural people into wage earners was manifested through the recovery by the State of all means of production and then by the establishment of the colonial wage system: The Minimum Agricultural Wage (SMAG: inherited from the colonial period and generalized to the whole country from 1964) that was called "advance on income" remained constant from 1964 to 1971 and was 7.54 DA per day actually worked (i.e. an hourly wage of 0.9425 DA). By way of comparison, in the BTP, the average hourly wage increases from 2.36 to 2.60 AD between April 1971 and April 1972, while at the same time the average hourly wage in industry and building increases by 2, 63 to 2, 88 DA for the simple employees even if it is higher than the national average for the highly qualified workers (from 3,86 to 4,4,5 DA). The size of this population movement varies according to the period. From 1962 to 1966, it would have affected about 600 000 people, an average of 150 000 per year: influx which, in a context of economic stagnation and high urban unemployment, was inevitably slowing down. Unemployment strikes in cities and in the countryside: 25% of the Algerian active urban population unemployed or underemployed in 1959, more than 50% in agriculture (out of the 370,000 agricultural workers in 1960, there is than 35% of them who have a permanent job). In 1962, half million of Algerians worked in France. During the first decade of independence, emigration to Europe and especially to France drained particularly large flows of rural people, thus limiting the influx to Algerian cities. But this "safety valve" will disappear from 1973, the "suspension" of this movement by the Algerian authorities coincide with measures increasingly restrictive of France. In 1962, the agricultural sector was the main activity in rural areas, but the investments made since 1963 have made it possible to recognize the development option already taken by the authorities of the revolution  (Table 1). Source: From Marc Ecrement, op cites. P47. Table 1. Public investments made from 1963 to 77. The financing of public investments made from 1963 to 1977 is estimated at 170.6 billion DA, of which 38% comes from the petroleum taxation. It is clear that from the outset agriculture, and therefore the bulk of the population (living in rural areas) received little investment to cope with the many problems it faces at the end of a long and exhausting war. Thus, reforms in the agricultural sector were initiated to finance the process of industrialization (to close the hole as Molina called it) and to wait until 1967 when the value of oil taxation exceeded the resources of exports agricultural and agribusiness and thus escape the opposition of France through the difficulties fomented since 1966 in this sector and ensure a transition of financing particularly by the hydrocarbon sector. In Mountain areas stretching over 20 million hectares and 63% of which are located at more than 800 m altitude. A quarter of these lands are located on slopes greater than 25%, little covered by degraded vegetation, the Popular sites of reforestation (CPR) had as main objective to involve the rural population, consisting of landless peasants and poor farmers, in the reforestation program, in areas of high unemployment for land development and exploitation. The fight against erosion has also developed in Algeria with a rural equipment strategy called DRS (Defense and Restoration of Soils). This colonial strategy, launched since 1940, was intended, on the one hand, to prohibit the exploitation of the forest by the poor and landless peasants, who were confined to the mountains following their expropriation, and on the other hand the protection of the lands and dams to promote colonial agriculture. This strategy was maintained and strengthened after independence following the recommendations of the advisers of the Ministry of Agriculture and Agrarian Reform of Algeria (MARA). The local know-how in the field of soil protection and water management widely used by the Romans in the Mediterranean countries has been neglected and its use remains very limited in Algeria (Jijel, Bedjaia) following the expansion of the achievements of DRS and mechanization of agriculture nearly 400,000 hectares of land. The government has made significant investments in the DRS strategy. The high cost of the majority of the works and the inconclusive results led the public authorities in 1977 to abandon this strategy. It is under the advice and the very deep influence of Monjauze (French adviser to MARA), that reforms of the rural sector are undertaken for the fight against erosion, which cannot be reduced to a purely technical problem of realization and promotion of the bench but by the introduction of a new concept: that of the integration of the bench in the socioeconomic context of the country. The objective was to reconcile the interests of peasants who live on lands requiring development and protection objectives led to develop a new doctrine: that of rural renewal. However, everyone agrees that the banquettes did not stop the erosion where they were introduced: "The method of progressive terraces and terraces, coming from the traditional know-how and strategy of the peasants, seems better to address this issue of protection and enhancement of vulnerable areas in rural areas. This experience shows the limitations of using equipment strategies when they are not made by and for farmers. After 40 years of DRS, the land continues to degrade and cereal production to decline, erosion to develop and dams to sink rapidly; farmers, who have lost 5 to 15% of usable agricultural area (UAA) have not seen their improved yields. This same experiment was reintroduced under the new name of “rural employment program” (PER), following the recommendations of the French researchers, in 2000. Algeria has inherited 14 so-called dams of large hydro with a total theoretical capacity of 487 hm3 as well as several underground drilling, especially in the Saharan oases like those of Oued Righ. Algeria had built from 1962 to 1980 three dams, one of which was already under construction during the war of liberation. This period is known by the dynamics at all levels. It was during this period that the Algerian experience in development was implemented within the framework of the SNDES. The change of power that followed the 1965 military coup came not as a response to a disastrous political or economic and social situation, or to change ideology and blocked strategy but rather to accelerate a process which has already begun but with more intransigence and authoritarianism. It is, moreover, in the speeches of the president of the council of the revolution (Houari Boumediene), then minister of the national defense and instigator of the military putsch, and also in the contents of the texts of the national charter of 1976 and that of the agrarian revolution, that economic and social policy will be applied in Algeria on the basis of imperative planning. This new logic in the action of the State "had two parallel aims: on the one hand the liberation of the economy from foreign dependence and the recovery of our national wealth and on the other hand the building of an economy national, free, based on solid foundations ". On the occasion of the celebration of November 1, 1965 (just five months after the military coup), the President of the Council of the Revolution considers that the industrialization "aims at the manufacture on the national soil of its own capital assets to provide a solid foundation for our economic development." He affirmed, indeed, that "realism commands us not to forget that our agriculture will not itself find all the means necessary to concretize the hopes that socialism carries within it”. Industrialization will be the decisive role of creating new sources of income . It was necessary to initiate reforms in the agricultural sector to finance the process of industrialization, to "plug the hole" in the words of Molina and wait until 1967 when the value of oil taxation exceeds the resources of agricultural and agri-food exports. The agrarian reform is understood here as a set of development and adaptation of agrarian structures in order to obtain a maximum growth of the agricultural product which can give the financial surplus that can be mobilized for its investment in the industry. Agrarian reforms take place in all countries without distinction and are the responsibility of the public authorities. In reality they are legislative and technical measures to bring about changes in the relations of production in the countryside according to the balance of forces existing between the different components of the social system. The agricultural sector entered into an export crisis from 1967 onwards. It accounted for 16.2% of total exports, which in 1979 fell to 1.3% of total exports, following the repressive measures taken by the France to counter the nationalization of strategic sectors engaged by the new leaders of Algeria. The problem is mainly due to the adoption by the EEC countries of an economic blockade aggravating the financial situation of Algeria, notably by the non-removal of wines (by France) and the lifting of the tariff reductions previously benefited Algeria from the Common Market. Agriculture as an important activity, practiced in the rural sector, is characterized by the diversity of productions, by the mode of organization (traditional subsistence agriculture, merchant, modern, concession, farming, Khemmassa, etc.) and the diversity of stakeholders (rural communities, city dwellers, states, NGOs, local communities, etc.). Although it is subject to strong constraints, agriculture still manages the countryside and is a major producer of food and feed. To this end, it has for a long time been the object of numerous state interventions in various forms ranging from development programs to centralized policies for the agricultural sector to actions on the agricultural and agro industrial sectors (Figure 1). 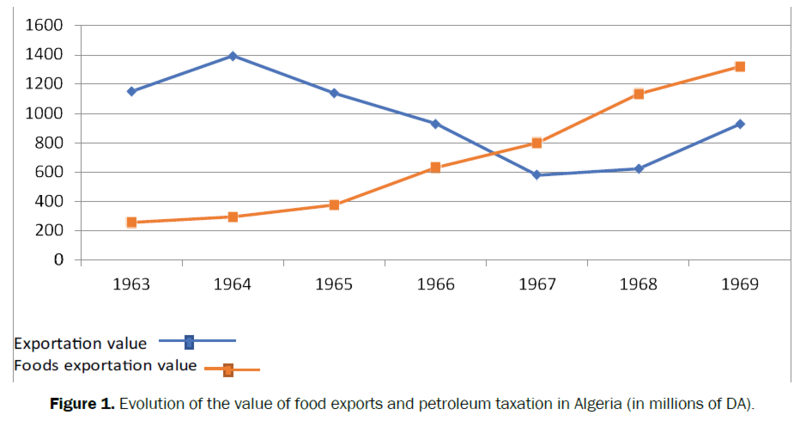 Figure 1: Evolution of the value of food exports and petroleum taxation in Algeria (in millions of DA). To implement the socialist option, the plan is considered as the preferred tool for the direction and management of development. To this end, Algeria first requested the World Bank (WB) to help it set up a national planning system. Unfortunately the experts of the WB have preferred to propose in their final report a mode of liberal development which is judged by the Government of the time "as incompatible with the Algerian will of independent development". Then, the central planning body of the Soviet Union (GOSPLAN) was called upon to send an armada of experts to define the methodological basis for what later became the national planning system. The triennial test plan is launched from 1967 to 1969; the first real plan of development is the first quadrennial plan 1970- 73, the second quadrennial plan is the one launched in 1974-1977. The following table explains the general trend of economic policy towards the amplification of investments in the industrial sector and the marginalization of the agricultural sector (Figure 2). Figure 2: Evolution of investments by sector in %. The following table explains the general trend of economic policy towards the amplification of investments in the industrial sector and the marginalization of the agricultural sector (Table 2). Source: in Molina. I. CREAD, 1982. Page 235 to 443. Table 2. General distribution of public investments in %. The abolition of ONRA has been replaced by more than twenty independent offices all involved in the agricultural sector according to the type of activity (OFLA, CCLS, ONACO, ONPO, ONLAIT, ONV, ORAVIO). In 1968, livestock cooperatives were set up, under the supervision of the Association for the Development of Pastoral Farming (ADEP) created in 1969. These cooperatives benefited from the best rangeland and a great logistical support from the State. They were dissolved in 1976 and did not meet the objective of improving pastoral production and rangeland management. The agrarian revolution first major operation in favor of the countryside since independence, set itself as a priority objective a "fair and efficient distribution of the means of production and first of all the most important of them, the earth and this so to provide a fraction of the peasantry poor and landless. The agrarian revolution is understood here as the set of profound (structural, economic and social) and irreversible changes initiated by a political system whose purpose is to break with the modes of previous organizations . This allocation was to be achieved through nationalization and land tenure legislation, on the one hand, and through the establishment of service co-operatives and a financial assistance policy on the other hand and material of the State. This operation makes it possible to recover, from 1972 to 1976, a little more than one million hectares of land of very unequal quality for the benefit of some 85,000 beneficiaries (about 10% of the poor or landless peasants) grouped together for the first time vast majority in production cooperatives. A program of "thousand socialist villages" was launched in the summer of 1972, to offer the beneficiaries new rural centers, consisting of 100 to 150 housing-type housing with electricity and drinking water, and having major facilities (school, dispensary, shops ...). This new living environment has improved the living conditions in some rural areas affected by the program and the reduction of urban-rural inequalities. But this urban type of housing has in some ways contributed to the spread of urban-type consumption patterns and to the search for extra-agricultural income: in the most industrialized regions, the "socialist villages" have been transformed into workers' cities. The continuation of this program has only made it possible to realize that 400 villages (instead of the projected 1,000) constitute the least contested "acquired" of the "agrarian revolution". The structural policy, based on the agrarian reform of 1971, was part of the strategy of the industrializing industries, therefore any transition to a more accelerated pace of industrialization required that the agricultural sector be completely mastered in order to be able to generate a surplus through the taxation of producer prices and the supply of large urban centers and also to stabilize the political situation and establish the bases of a hegemonic state apparatus in view of the demographic importance of the rural world (rural population in 1966 was 8,314,000, in 1973 was 9,400,000, in 1977 was 10,067,000 according to the various censuses from 1964 to 1977). In the national development plan set out in the first four-year development plan (1970-73), industry had to contribute to modernizing agriculture by promoting technological change conditional on prior changes that needed to be made in the areas of agriculture organization of agricultural production and land structures. In other words, it is expected that agriculture particularly that owns the richest land and state property, to increase the use of highly capitalistic techniques and consequently reduce the number of agricultural workers (in first by the reduction of seasonal workers and the retirement of permanent workers). However, the Ministry of Agriculture surveys show that a large number of unskilled agricultural workers were not used by the SRA and the SAE during certain seasons of the year (out of a total of 239,292 workers, 121,301 or 50.69% are permanent workers, compared to 117.991 who are temporary workers who do not exceed 17 days per month in certain periods for a daily wage of 15.3 DA). This objective has also had dangerous consequences for the food security of the nation, which has seen its self-supply rate of basic foodstuffs (milk, pulses, wheat, etc.) diminish in favor of an unjustifiable increase imports of agri-food products during the 1970s and continues to this day. 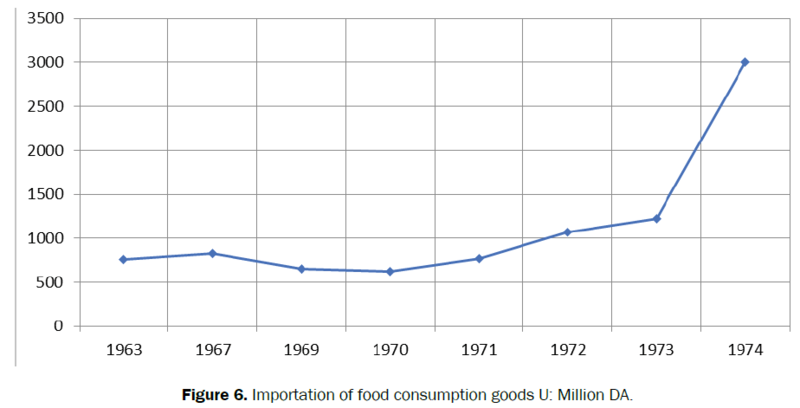 Since 1967, agricultural exports have been declining in favor of hydrocarbon exports, and as a result, an increase in food imports has become a necessity in order to prevent food shortages as a result of the abandonment of agricultural and agri-food production (Figure 3). Figure 3. Evolution and Structure of Imports in Current DA. The first phase, launched on January 1, 1972 to June 16, 1973: Was intended to constitute from the communal land, land, HABOUS, and land of other public authorities (3000, 000 ha planned) a first agricultural land. Also, during this period (1972-1973), there was the promulgation of the Pastoral Code within the framework of the Agrarian Revolution. The main objective is the safeguarding of the rangelands by the limitation of the herd, by the defenses, the prohibition of the plowing on the pastoral zones and the uprooting and peddling of the ligneous. Conflicts of interest appeared during the application of the Pastoral Code and all these provisions could not be applied. The second phase, launched on June 17, 1973 to June 16, 1975: aimed at the nationalization of the properties of absentees and the limitation of large landholdings (private sector); the land thus recovered (646,647 ha planned) would be transferred to the national fund of the agrarian revolution. Revolution gave rise to the creation of the Communal Polyvalent Agricultural Cooperatives of Service (CAPCS). Put in place in the summer of 1973 to make available to the agricultural sector (from the Agrarian Revolution and to a lesser extent the private sector) the tools of working the land and to fulfill the role of animator of economic and social life (carrying out custom work, in the supply of fertilizers, seeds and other raw materials used in agricultural production, meeting place between farmers and place of information and communication). In mid-1979, the number of CAPCS created was 674 out of 703 municipalities in the country. These CAPCS acquired during the Second Quadrennial Plan (1974-1 977), nearly 4,000 tractors, 1,300 combine harvesters, 1,400 disc plows, more than 1,300 plows, 1,260 trucks. The expansion of the CAPCS equipment park has called into question the preeminent role of large farmers and traders in agricultural work services across the countryside and enabled them to earn substantial rents. During the Second Development Plan (1974-1977), the State launched so-called cereal intensification operations, thus granting material and financial aid to the private agricultural sector. This aid consists of the free distribution of fertilizers and pesticides, selected seeds and custom work carried out by the CAPCS. Nearly 50,000 farmers will be affected by this operation which has also extended to the fruit and wine plantation operations carried out on 90,000 ha of the private agricultural sector, infrastructure development and hydraulic equipment (well drilling, spring catchments), motor pumps and apiaries to encourage the practice of poultry farming and bee-keeping. But given the small financial capacities of small-scale farmers (especially subsistence farmers), so-called "intensification" operations have benefited large and medium-sized farmers much more. In the case of equipment loans granted on temporary (refundable) loans, it is recognized today that the policy of "loans to small peasants" applied before the Agrarian Revolution had finally benefited the wealthier farmers, that is to say the most influential. As soon as the agrarian revolution was implemented, credits granted to the private agricultural sector were reduced34 and then totally blocked as soon as the second phase (1973-1974) came into force. A revival of this policy took place in 1976, a recovery which was confirmed in the following years. The third phase, which was supposed to concern the development of the steppe and the limitation of the herd, began on November 8, 1975. Initially the big breeders and their associates’ largely urban or rural dignitaries showed a resistance and relying for the delay on the high mobility of the herd. It was to concern the communal and state roads and ARCH lands on nearly 20 million ha. In practice the third phase was then reduced to the creation of 200 pastoral livestock cooperatives (CEPRA) and 49 ADEP and the payment of land to the National Front of the Agrarian Revolution. The pastoral areas received only 0.5% of the payment credits granted to the Ministry of Agriculture during the period 1974-1979. Special programs for rangeland management and development of sheep production have been launched, mobilizing significant resources for agro-pastoral development in about ten steppe districts. The fundamental failure of the cooperatives experience (collective exploitation of agricultural resources), advocated by the agrarian revolution it’s appears in his "granted" character. This operation, entirely conceived and implemented by the ruling elite, claiming to "liberate the creative initiative of the rural masses" who aspire above all to the security of wage labor, locks them into a role of passive performer. Imposed from the outside, it was considered the only real form of social promotion. This experiment did not have the means and the necessary time of ripening to be able to adapt it to the psychological, social and technical conditions of the Algerian peasants . The customs and the traditions for mutual practices of aid and collective work such as Djemaa and Touiza that representing two ancestral forms adapted to the Algerian society for local governance and mutual aid. i. At the end of 1978, 5,980 cooperative or pre-cooperative units were counted, of which 3/4 were agricultural production cooperatives of the Agrarian Revolution (CAPRA). 1. CAPRA (4,205 units) accounted for 72% of the total units created, comprised 65% (52,000) and 82% of the UAA (735,906 ha). In terms of land structure, it should be noted the small size of the units (180 ha on average) and the collectives of cooperators that compose them (17 recipients on average against 82 workers in the state agricultural sector). 3. The pre-cooperative development groups (GMV) are 914 units (16% of the total), 7% of the beneficiaries (5,650) and are installed on 10% of the allocated UAA. 4. The Peasant Farmers' Groups (GEP) 176 and the co-ownership groups 10 which represent the least developed forms of agricultural co-operation - at least in legal terms - concern 5% of the beneficiaries (3 950) and 1, 5% of the total UAA allocated to the cooperative system. The production farms of the Agrarian Revolution occupy 1,005,600 ha of UAA, or slightly more than 13% of the total UAA of the country, employing nearly 100,000 beneficiaries and about 10,000 seasonal workers, i.e. 8.2% of the total population the agricultural labor force in 1978. The production sector of the Agrarian Revolution (SPRA), which initially benefited from certain advantages and priorities, in 1978 would own 14.8% of the traction equipment (unlike the private sector (SPA) which had only 23.7% against 47, 8% for the State Agricultural Sector (SAE)), 1 3% of the harvesting equipment (the rates are 67.9% for the SAE and 0.2% for the SPA), 12.5% of the material (55.6% for the SAE and 21.9% for the SPA) and finally 14.2% of the transport equipment (while the SAE would own 36% of this equipment and the SPA 34.6%). In terms of production, especially the most important speculations; during the 1977-78 seasons, SPRA supplied 13.6% of cereal production (2.1 million quintals), 11.8% of pulses (78,850 q) and 8.2% of vegetables. Yields remain for the main, very low speculations (5 q / ha for cereals, 5.2 q / ha for pulses and 50 q / ha for potatoes). They are at an intermediate level between the spa and the SAE for cereals but are lower, if one refers to official statistics, to these other two legal sectors. 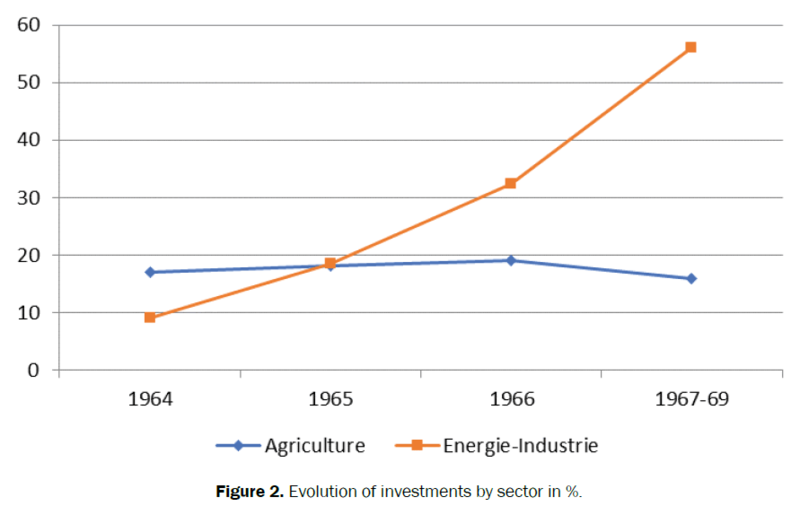 In terms of investment, the share allocated to agriculture continues to fall from 1967 to 1977, from 25% in 1966-69 to 5% in 1980-84. Moreover, the consumption rate of these investments dropped from 100% in 196-69 to 28% in 1974-77. This means that there has been a deterioration of equipment over time without being renewed, which is hurting agriculture from this obsolescence of equipment and means of production (Figure 4). Figure 4. Structure and evolution of public investments % Structure and evolution of public investments %. The economic impact of its restructuring planned by the ruling class of the moment was to increase the availability of food and agriculture to feed the "army reserve" industry suddenly to strengthen the industrial investment by improved farming techniques and varietal choice. Also it had to stop the rural exodus by the delay of the migratory flows of the countryside towards the cities can be appreciated through the mode of occupation of the grounds and the level of production. 17,000 people per year between 1966 and 1968 to 40,000 between 1968 and 1970 and 80,000 between 1970 and 1973 (an average of 150,000 migrants per year). In addition, the urbanization of rural centers began in 1970 when the growth of inner cities was three times faster, from 80,000 in 1973 to 256,000 in 1970. The rural exodus during this period evolved as follows: 17,000 people per year between 1966 and 1968 to 40,000 between 1968 and 1970 and 80,000 between 1970 and 1973 (an average of 150,000 migrants per year). In addition, the urbanization of rural centers began in 1970 when the growth of inner cities was three times faster, from 80,000 in 1973 to 256,000 in 1970 (Figure 5). Figure 5. Evolution of the rural population in Algeria %. Although the percentage of the rural population in relation to the total population decreased from 68.6% in 1966 to 42.1% in 1998, the relative share of this population is constantly increasing (Figure 5). During the 1970s and 1980s, about 1,500,000 rural people migrated to the cities, but without causing "rural desertification", whose population continues to increase. The stagnation of agricultural production is combined with population growth to constantly worsen the country's food dependency. From US $ 766 million in imports in 1963, the value of imports took a dangerous turn starting in 1973, having risen to US $ 3 billion in 1974 (Figure 6). Figure 6. Importation of food consumption goods U: Million DA. In the sense of the change that the new reform of agrarian structures on land occupation must allow, it seems that, apart from the sharp reduction in the area of vineyards and the increase in the areas of citrus, the agricultural area has remained identical to that of the first years of independence  (Table 3). Table 3: Evolution of land occupation. The intensification of cereal production which, up to the present day, constitutes the staple food of the Algerian population (139 kg in 1962, 191 kg in 1982, 224 kg in 1992 and 217 kg per inhabitant per year) did not happen. During the period 1977-82 we fell below the levels reached in 1962-67 (896,000 T of comics in 1962-67 to 720,000 T in 1977-82). The failure of the agricultural and rural development experience during this period is amortized by the country's capacity to massively import foodstuffs to meet the local demand resulting from the population explosion in the urban areas, as well as urbanized by the imposition of a "sustained food" consumption model, as in the case of "turn-key" or "product-in-hand" industrial complex models launched during the same period. This import capacity thanks to oil revenues has a positive impact on the food intake of populations, even those in the countryside. The urbanization of the rural world and the imposition of a consumption model could also allow the creation of other nonagricultural activities in the rural sector; in 1977, this involved 1,644,700 people while the occupied population recorded in agriculture amounted to only 692,000 people. This integration of the peasantry into an external labor market has complex and contradictory effects, contributing both to the decomposition of family farms and their consolidation, but in all cases to the survival of a very large number of rural families. The fruits of the effort of building an independent and locomotive national economy for the overall development of the country are questionable from 1980. It was then that after the death of President H. Boumediene that the FLN Congress was invited to initiate a change, from a mild departure (change in continuity) to a five-year plan 1980-1984 which will be catastrophically followed by the second five-year 1985. -1989. It was during this period that the self-managed estates were transformed into several socialist agricultural domains (DAS) and the implementation of the Land Tenure Program (APFA) especially in the South. It is also during this period that the first five-year plan is launched and the restructuring of public enterprises started. It must be said that this period saw the opening of agricultural credit and technical support to the private sector which has taken a very important step. The Agrarian Reform of 1981 (the restructuring) experienced by the agricultural sector is actually limited in time and space because it will mainly concern the self-managed sector and will be obsolete since 1987. 3. Rural development of the socialist sector. The objective also through this reform is to achieve the optimum development of each part of the agricultural area by the establishment of economically viable production units whose organization and management is integrated at best in cooperative mechanisms. This reform should affect the cooperatives of the former Mujahideen, the agrarian revolution cooperatives having experienced a high rate of withdrawal, as well as the lands of the NAAF not yet allocated. It was during this period that agricultural policy, driven by economic liberalization and the abundant socialist reforms of Boumediene, embarked on new directions in the steppe. Thus, the dissolution of pastoral cooperatives, the abandonment of the Pastoral Code in 1982 and the adoption of the steppe file in 1985 led to the creation of the High Commission for the Development of the Steppe (HCDS). This police station was to set up a new mode of management of the steppe through the involvement of local pastoral populations, which were at the origin of the failure of previous policies and taking into account all the economic and social aspects, including the integration of pastoral communities in the steppe development process. This is the period of major economic and political reforms in Algeria. It is also the period of the great economic and political crises which rocked the country towards situations of self-destruction after the recommendations of the IMF and the World Bank for a structural reform of the Algerian economy (structural adjustment program) this is a condition sine qua non for the award of grants and financing. This period saw the reorganization of the DAS in 1987, which was disrupted as an individual farm (EAC) and individual farm (EAI) for the benefit of the restored government dignitaries, government officials and DAS workers, with full liberalization of the upstream and downstream structures of agriculture. It was also in 1990 that national lands were revolutionized in 1971 and returned to their original owners. The "reorganization" of 1987, legalized by Law 87-19 of 8 December 1987, consists in the sharing of 3,415 public sector DAS in 28,000 collective agricultural holdings (EAC) and individual farms (EAI) for the benefit of workers, technicians and other agricultural personnel who request it. Some plots were awarded under the government's youth employment program in 1988. In order to establish an exclusive link between the income of the producers and the result of the production, the State, while retaining its right of ownership, gives to the new farmers a perpetual right of enjoyment on the agricultural lands (for a fee on right similar to the cost of renting) and grants a right of ownership over all the property (other than land) existing in the farms. These rights are allocated in the undivided and equally between the members of the collectives of the exploitation; they are transmittable and transferable within the collective framework of each farm. Thus, the management of the exploitation is ensured collectively by these producers who are held to the direct and personal work of the land. No other person or authority should interfere in their activity otherwise they will be liable to penalties provided for by the Civil Code and the Penal Code. Farmers freely develop and implement their production plan, market their produce and take care of the supply of factors of production. This "reorganization" has also affected environmental, marketing and supply structures and in some measures agricultural finance. Formerly cooperatives or offices under the aegis of the State, these structures are sold with their assets and their liabilities to groups of persons coming from the administration, producers and workers. Their current functioning is more like that of a public limited company or only the commercial margin counts. These cooperatives are governed by the laws concerning commercial enterprises. The State has also ceded many of these powers to professional organizations (Chambers of Agriculture, inter-professional councils, farmers' associations, etc.) set up in 1989/90 by government decisions on the basis of the new provisions of the constitution, which, since 1989, have allowed the creation of socio-professional associations. All these changes are part of a broader framework of the structural reform of the entire national economy started in 1986, according to the recommendations of the IMF and the World Bank. During the same period (1989/90) the claims of nationalized landowners in 1971 led to the recognition of their right to reclaim their lands. Two laws (90-25 and 90-30) restore private ownership of all lands prior to the 1971 reform. However, implicitly authorizing (what has really happened) the sharing of ABCs that request it or following conflicts identified by the agricultural services; some ABCs have given birth to EAIs contrary to the 1987 and 1990 laws. The laws that created them are ambiguous and the indecision of power to definitively settle the land problem amplifies their instabilities. The steppe development program and the green dam: With a view to curbing the desertification process and maintaining an ecological balance of the environment through the rational exploitation of resources, Algeria has carried out a bold project "Green Dam" which was to result in the planting of forest trees (mainly the Aleppo pine whose choice has been questioned by many specialists.) and some fruit species on a depth of 10 to 30 km and to join the Tunisian and Moroccan border (on 1500 km on average). This project, entrusted to the young people of the National Service from 1970 to 1990, mobilized enormous human, material and financial resources was designed and supervised by the agricultural services represented by the Directorate General of Forests. Unfortunately to date, no serious evaluation has been done to measure the magnitude and correct the failures. According to many specialists the green dam has not achieved the expected results because of the lack of prior studies, grazing, and the lack of participation of the population in the project. The national plan to combat desertification: The national plan to combat desertification, developed and implemented since 1987, was part of the various steppe development programs. It aimed at intensification and extension of the green dam project by limiting the mechanized plowing by locating them, in the context of the development, at the level of the potential agricultural zones (Dayas), the reconstitution of the degraded forests of the Saharan Atlas through mass reforestation, defending the degraded parameters in order to reconstruct the pastoral carpet and the establishment of an infrastructure to open up marginalized areas. vii. The fight against unemployment. During the 1987 - 1998 decade, the Algerian population became predominantly urban (57.3%) (See table below). The relative share of the rural population is therefore trending downwards, especially over the last decade, but this population continues to grow in absolute numbers (from 11.6 to 12.3 million people between 1987 and 1998). ). This tends to prove that despite the exodus to small and medium-sized cities that have experienced in recent decades a greater influx in terms of population, rather than to large metropolises including those located on the coasts (rate of urbanization below 1, 8% inherent to their structural saturation), the countryside and in particular the wooded areas are not yet threatened with "human desertification" (Table 4). Table 4. Evolution of the population according to the dispersion. -Support the needs of the national economy (supply of agricultural raw materials, outlet for industrial products and source of financing of other sectors of the economy). A National Consultation on Agriculture was held in 1992, made it possible to mark the constraints of agricultural production and also the most influential actors in the sector (the new farmers) who will be the spearhead of the NADP, in 2000. However, agricultural production has remained for a long time below expectations and far from being able to reduce food dependence, which leads to a hemorrhage of currency resources and the agri-food industry and largely dependent on external supplies (Table 5). Table 5. Import structure of agricultural and food products in 2002 (in %). The results during this period remain marked by a significant increase in the rate of growth of agricultural production of 4%, and an annual growth higher than that of the other sectors of activity (3.3% against 1% for the industry and 2%, 3% for services) . The results of the intervention of the State through the agrarian reform policies appear clearly in the increase of the agricultural productions but contrary these evolutions could not reach the satisfaction of the food needs of the populations. Economics experts say that the main constraint of food insecurity is the imbalance between economic and demographic change. The liberation of the national economy has been very costly in terms of job losses and expenses related to the restructuring of public enterprises, but also in terms of the standard of living of households jostled by the lifting of state support for a large part of consumer products without a significant increase in household income. The unemployment rate rose from 17 to almost 25% over this period (1986-1994) and to 28% in 1995. Household disposable income, especially for employees, fell by 20% in real terms. However, Algeria's commitments to the IMF (International Monetary Fund) and the World Bank were all honored, leading to new reforms . The National Agricultural Development Program (NADP): The agricultural sector (agriculture and forestry), considered very late, benefited from a development program whose objectives "converge towards the reconstitution of agricultural territory and the development of production" . 1. A change in the agricultural development strategy that is no longer based as it is on self-sufficiency in self-produced agricultural goods but on "food security" that tolerates the production and export of agricultural products. 2. The introduction of the environmental concept in the management of space to achieve the goal of sustainable agriculture. 3. The priority of the agriculture sector is to guarantee a level of food security for "people's access to food products, better coverage of consumption by national production ...". This means an orientation for the search of export markets for luxury products of recognized quality and the promotion of products with high added value. In other words, there is a tendency to seek a balance in the agricultural trade balance covering imports through exports. vi. the Saharan agriculture development program. (Rehabilitation of oases, enhancement of the periphery, great development). These programs address three major concerns: the development of agricultural production and productivity, the preservation of natural resources (soil and water), and the increase of the useful agricultural area [20,21]. An assessment of the activities supported by the public authorities during the period 2000-2005 makes it possible to note the effort made. Out of a total investment of almost 4 billion euros, the FNRDA accounted for 58% of the financing of agricultural activities for an amount of 2.3 billion euros, which represents an allocation of 270 euros per hectare of useful agricultural area [22,23] (Table 6). Source: Summary of Gredaal, 2005. Table 6. Balance sheet of operations financed under the NADP (2000-2005). iv. the protection of the environment and the valorization of rural heritage. It is understandable, through the reading of the PRR presentation texts in 2006, that the latter aims at creating the necessary conditions to maintain a number of rural people in their territories (revitalization of rural areas) and to encourage maximum exploitation of agricultural potentialities (Valorization of natural resources) with a view to sustainable development. Proximity Projects for Integrated Rural Development (IRDP) are designed to be defined and implemented in cooperation with local actors. These actors are defined in advance by the local administration and meet the requirements of laws on associations and unions, legislated in the midst of political and security crisis and therefore cannot reflect a social reality where it is expected a dynamic force by force proposal, the ability to take initiative and follow up development actions that are relevant to the future of rural people and their children. The Algerian rural environment has been since independence, the theater of multiple public interventions that have been carried out either as part of development programs with a strong vocation of equipment to open up populations or improve their living conditions, either in the context of sectorial policies aimed also at the realization of socio-educational infrastructures or public facilities (roads, electrification networks, water supply, sanitation, schools, health centers) all carried out by the highs without participation real actors in these rural areas. 1. the so-called "classic" missions towards rural territories such as spatial planning with a view to improving equity and territorial attractiveness, must remain the responsibility of the particular State heavy infrastructure or the definition of longterm development strategies and training policy. 2. The mission of financing is another mission that the State, consistent with its partners, ensures, activate and adapt to all the tools at its disposal (subsidies, investments, credit) to contribute to "irrigate" the rural territories. The evaluation of the proper use of public money must be a tradition that is shared by the administration, elected representatives (local and national parliament) and civil society. For that, it is time to legislate, in a clear and obliging manner, the right to information (making available and publishing with public access of the data) of the citizens particularly the researchers . 1. The dynasties of 10 in 14 e century have create a gap between them and the populations countryman by taxes and taxes required without counterparties regarding support for the development. Turks continued the tax scheme of the farmers until impose taxes on the property of one goat. French by their colonial marginalizing and expropriating system the farmers did not last in the multiple peasant revolutions even if he set up a "modern" said new agricultural system but which was totally extrovert. The governments which followed one another after the political independence wanted too to impose a hegemonic and dictatorial political system to base a foreign socialist economic system, and even refused by the major part of the farmers. Even for good reasons, for equality and for justice, the Algerian farmers adapted themselves to break what was imposed on them. 2. The incapacity to implement a strategy in coherence with the capacities and the habits of the majority of the population and by implying any stakeholders of the sector to participate in the elaboration and the realization of the fixed objectives, was one of causes of the bankruptcy of these experiences and that it's time to rethink the approach and the tools to reach the goals of the food safety and of improvements of the living conditions of the citizens. Lessenich S. The reinvention of the social. The social State in the flexible capitalism, 2008. Gallisot R. Attempt to define the mode of production of the pre-colonial Algeria. In Algerian J. 1968;2:385-412. Boudia M. Analysis of the social formation pre-colonial of Algeria (1962-1978): underdevelopment and socialism. Algiers (2nd Edn). Paris: Ed. Economica, 1977. Benachenhou A. Rural exodus in Algeria. Ed. ENAP, Algiers. 1979;p:144. Addi L. From pre-colonial Algeria to colonial Algeria. Algiers: ENL, 1985. Estoublon L. Annotated code of Algeria. Algiers: Tome II., 1903. Bourenane N. The structural causes of al crisis in Algerian agriculture. The agrarian policies in Algeria: towards autonomy or dependence. In: Cahiers du CREAD Review, Algiers. 1982;Pp:175-229. Sari D, Keddache M. The Algeria in history: political resistance (1900-1954). Socio-economic upheavals. Algiers: Ed. OPU and Ed, ENAL, 1983. Molina I. Agrarian policy: sectorial integration and structural change. The agrarian policies in Algeria: Towards autonomy or dependence. In: Cahiers du CREAD Review. 1982;Pp:235-443. Bedrani S. Agrarian policy: sectorial integration and structural change. The agrarian policies in Algeria: Towards independence or dependence. In: Cahiers du CREAD Review, 1980. Charles-Robert A. History of contemporary Algeria. Paris: PUF -Que sais-je, 1977. Ecrement M. Political independence and economic liberation: a quart century of development in Algeria: 1962-1985. Algiers: ENAP-OPU, and Grenoble: PU, 1986. Mohamed-El HB. Economy of the development of Algeria (1962-78): Underdevelopment and socialism. Algiers (2nd Edn). OPU, and Paris: Economica, 1979. Omar B. The agrarian revolution in Algeria: continuity and rupture in the process of agrarian transformation. In: The Third World Review. 1980;21:605-626. Côte M. Country, landscape, peasants of Algeria. In: CNRS Review. Paris, 1996. Hersi A. Mutations of agrarian structures in Algeria since 1962 (2nd Edn). Algiers: OPU, 1980. Baci L. Agrarian reforms in Algeria. In: Cahiers Options Mediterranean Review. 1994;36:285-291. FAO. The state of the food insecurity in the world. The report 2011 on the hunger: persistent volatility and firmness of food prices. Rome, 2001. UNDPA. Map of the poverty in Algeria. Report of Study. 2001;p:104. Henri-Irénée M. Of historical knowledge (Du Seuil Edn), 1954. Nikitin M. Utilities and methods in history to management sciences. In: Laboratoires Orléanais de Gestion (LOG). 1997;p:5. Prenant A. Urban land ownership in the region of Tlemcen and Sidi Bel- Abbes, Algeria. In: Annals of Geography Review. 1967;p:3. Bernard S. History of Algeria since independence (1962-1988). Collection Theoretical. Doctoral Thesis state es Economic Sciences, Algiers University, 2004.